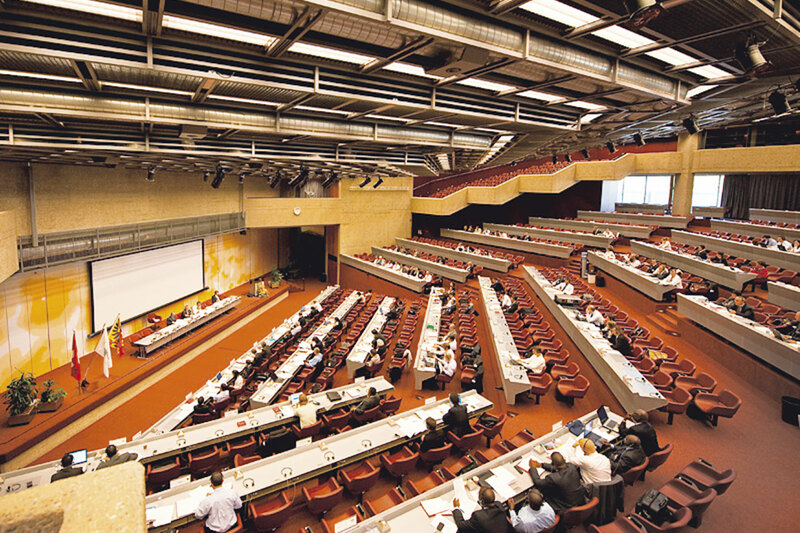 The Centre International de Conférence Genève (CICG) was inaugurated in 1973. 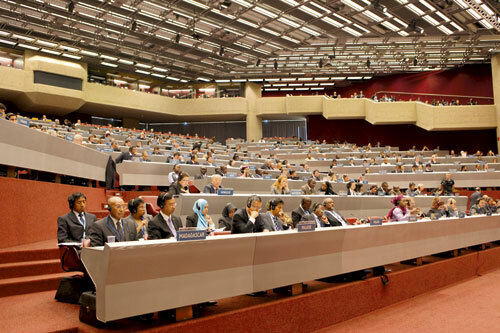 27 conference rooms are at the disposal of the numerous international organizations for their congresses and conferences. A new system was scheduled for 2012. Important renovation works had been performed on the building and on the technical installations in 2004. However, the investment was not sufficient, and thus the result was not satisfying for the sound system of the two big conference rooms with respectively 750 m2 and 1400 m2. The RFP asked for intelligent system solutions for room 1 and 2, with the possibility to run the installations simultaneously in case of plenary assemblies. Room 1 with a capacity of 970 places is equipped with an amphitheater-style seating, room 2 with 550 places is adjustable at will. During the conferences the main language is amplified by the speakers. Participants who are following the conference in a translated language are using headphones. The design has been performed by the company ACR Fuchs Hanimann in close cooperation with Tucton, the Swiss distributor of Kling & Freitag. After a precise analysis of the specific project requirements a ceiling-mounted sound system turned out to be the most advantageous solution. The model Kling & Freitag GRAVIS 12 has all characteristics required by this challenging project: high efficiency, precise directivity, discreet aspect, light construction and well-conceived installation hardware. For the calculation of the number of required speakers we could entirely rely on the precise manufacturer’s data. Thanks to the two variants of this loudspeaker with different coverage angles – GRAVIS 12 W (90° x 50°) and GRAVIS 12 N (65° x 50°) – it was possible to obtain a regular coverage in spite of the ceiling height variation from 4 m to 9 m. Due to the high efficiency, only 20 GRAVIS 12 W, 17 GRAVIS 12 N, and 6 PASSIO speakers and 3 x SystemRacks with CD 44 were needed to satisfy all wishes. An on-site test presentation of the designed system together with the existing installations such as conference equipment was part of the basic conditions of the RFP. The demo-system was installed successfully in July 2012. Measurements confirmed design and simulations, and customer’s expectations were fully satisfied. The project was finished by the end of 2012, and it was a success for all participants.